Having just returned from the ATOURZ/CITC/Sri Lankan Airlines Fam trip to Sri Lanka, I find that the experience of being there again (I first visited in 2005) is still a strong, pleasant memory of smiling people, culture, history, tastes, smells , sights and discovery. While every one of the seven days in the country was packed with experiences and activities, the two days in Habarana were possibly the most impressive. Habarana lies in the centre of Sri Lanka’s cultural triangle where a number of fascinating attractions can be reached by car, usually within an hour, including Anuradhapura, Polonnaruwa, Sigiriya, Dambulla and Minneriya National Park. While we did not see Anuradhapura on this trip, we explored the other sites—each being an adventure unto itself. First off, I should note that we were based at the Cinnamon Lodge in Habarana for two nights, with each of the Fam participants (or pairs) having their own ½ bungalow to themselves on a large treed property, bordering a river with monkey troops patrolling the treetops, a variety of birds visiting the mangrove-like trees off shore, and the occasional mongoose poking around the dining hall in search of scraps.. It was like living in a park—with your own house! And we had the opportunity to check out the nearby and uniquely architecturally-designed Heritance Kandalama hotel with its distant views of Kandy and Sigiriya, as well as the Vil Uyana Villas, where one can actually walk to Sigiriya from your luxury private accommodation in about an hour. Polonnaruwa is a UNESCO World Heritage Site that includes reservoirs, temples, the Royal Palace complex, a huge Dagoba (Stupa) and sacred rock carvings of the Buddha. 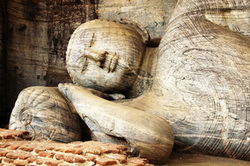 Polonnaruwa was a major city in the 10th to 12th centuries and is a great place to explore and appreciate history. A travel tip: When you are asked to remove your shoes before entering the temples, consider the 95 F weather and keep your socks on. The alternative is burned feet on the hot stone surfaces ! Sigiriya is another UNESCO Heritage Site that features water gardens, frescoes, a mirror wall and then the huge carved paws of the lion which presumably formed the basis of a lion’s head carved in the rock. The ascent to the top of the rock was through the paws and into a passageway in the lion’s mouth. This is a walker/hikers paradise based on the 1000 + stairs required to ascend to the top platform. The unique, natural rock formations in the park are impressive, before you climb the winding staircase to view the frescoes, and then descend another winding staircase before starting to climb up, up, up. The story of Sigiriya comes in different versions but involves murder, deception and sibling rivalry…ahhhh the stuff that makes for great drama! Dambulla, yet another UNESCO Heritage Site is a bit of an uphill climb, even if the bus parks in the upper parking lot but the caves are worth the huffing and puffing. Five caves are filled with over 150 images of the Buddha as well as some kings of days gone by. Strolling through and reflecting on the peaceful gaze of the Buddha’s can be a soul-soothing exercise, especially if you can wait out the bus groups and try to be alone, in silence and contemplation. Minneriya National Park is something you don’t expect in Sri Lanka. Most groups (including our own) spent time visiting the elephant orphanage in Pinnawela, but at Minneriya you board jeeps and head out to see wild elephants doing what wild elephants do in their family groups. Whether it is a fascination with two-week babies sleeping under the protection of their mother and aunts, or watching youngsters playing like kids in the water, or simply listening to the chomping of grass and gazing at eagles soaring in the sky or listening to the cries of the peacocks, this is a wonderful place for nature lovers.